The Ben Roethlisberger Foundation’s third annual fundraiser had Jergel’s Rhythm Grille in Warrendale rocking! More than 220 guests, including former Pittsburgh Steeler Charlie Batch and current Steelers Brett Keisel and Heath Miller, came out to support Ben and his wife, Ashley. DVE Morning Show’s Randy Baumann emceed the evening’s live auction, which helped raise more than $218,000 for local K-9 police and fire units, and the Make-A-Wish-Foundation. The coveted items included autographed memorabilia from Roethlisberger, Mario Lemieux, and Andrew McCutchen; “The Ultimate Nemacolin Experience;” golf getaways; and local hotel and restaurant packages. Jergel’s served up light and heavy hors d’oeuvres, while Bella Christie and Lil’ Z’s Sweet Boutique provided the decadent desserts and a fun donut cart. Guests also enjoyed dancing to the tunes of Nightsong. 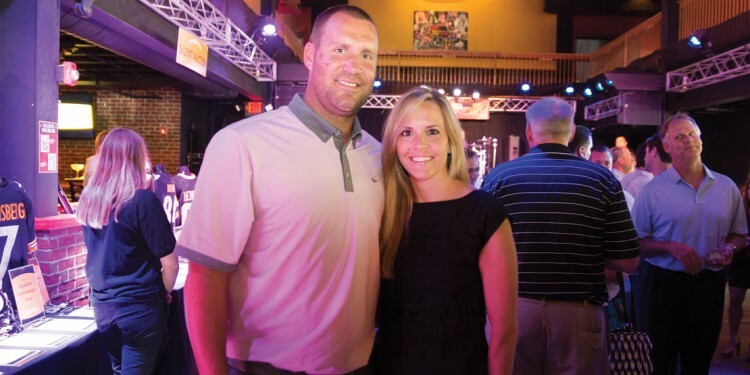 The event’s success proves that Big Ben is doing great work for Pittsburgh, on and off the field!